Born and brought up at Basa village in Solukhumbu district everest region, Cholendra Bahadur Karki grew up walking on the terrains of Himalayas. Building a deeper connection with the mountains and nature he learned the basics of hiking from his early childhood after working with his father as the porter. After graduating from Saraswati Multiple Campus he first started as an assistant guide and took part in the trekking and climbing adventures. Then he gradually started working as the trekking/tour guide. And, now with 15 years of experience in the field of trekking and climbing tours in Nepal, Tibet as well as Bhutan, he is the managing director of Himalayan Joy Adventure. Through his leadership in the company, since 2010, he has been constantly working to meet the travel demands of various travelers from all around the world. His main concern is to provide the travelers/trekkers with the utmost comfort, the pleasures and adventures of traveling at the same time. Down to earth, he is also working in the social sector to bring changes in the lives of the local people from the rural area of Nepal. Through his Non-profit organization- Aid for Nepal, he actively participates in bringing changes in the lives of rural people and help uplift their socio-economic condition. Plus, he is also the Director of Sampada Garden Hotel in Lazimpat, Kathmandu. He has been constantly involved into this business since 2016 to give the best services for food and accommodations to the customers. Ramkaji Karki was born near the “roof of the world” in the village of Basa, in the Solukhumbu district of Nepal. Basa is in the foothills of the Himalaya at 2150 meters/7054 feet. A few days walk further up into the high Himalaya in the same district is Mt. Everest, on the border of Nepal and Tibet. Ram started trekking working as porter then assistance guide, cook, guide and trekking leader. Ram has been working in tourism field since his young age. Ram has been taking trekkers and climbers into the Himalaya for 20 years. He has escorted many groups to Everest Base Camp, on the Annapurna circuit and to Annapurna base camp and Tilicho pass, as well as to Makalu base camp, Manaslu, and Mt. Kailash. 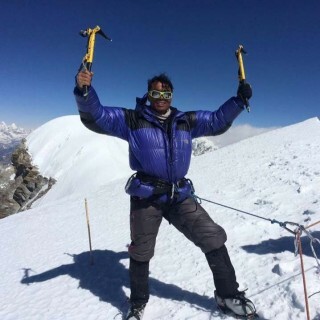 He has led climbs to Mera Peak, Yala peak and other small peaks. These years of solid experience led Ram to believe that he could provide clients with a first-class trekking or climbing experience and give them more personalized service than some of the larger trekking companies can provide. So he is helping his cousin Cholendra new trekking agency, Himalayan Joy Adventure from Australia as he is living in Australia for many years. He believes in sharing the sense of excitement and adventure that visitors feel when visiting the Himalayas. Our staffs have a wealth of local knowledge along with close relationships with people in Himalayan communities. We will go the extra mile to make sure you receive quality service and gain access to people and places not found on the pages of travel books. We can create unique itineraries to allow you to soak up the atmosphere, visit ancient cities and step inside to experience the life of the “mountain people.” When travelling with us you will feel a sense of comfort as you become part of our family. Born and brought up in Solokhumbu region, has early part of childhood is spent here. Growing up, he has special interest and love for nature. As a young fellow, has work experience includes a porter, cook, assistant guide and member in the tourism field. 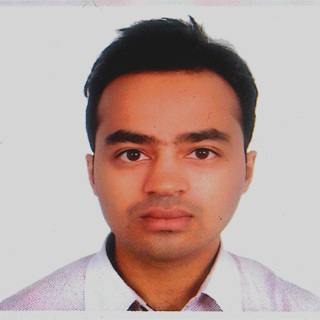 He has passed master's degree in sociology from Tribhuvan University in Nepal. He is a government license holder ever since 2006 and presently works at Himalayan Joy Adventure. As an avid lover of nature and adventure himself, has number one priority is to satisfy tourists and travelers alike making them feel at ease. His friendliness and knowledge naturally come his way warming up his group whenever he is on tour or trekking. He has immense experience as a trekking guide covering places in the Everest region, Annapurna region, Mustang, Kanchenjunga region, Dolpo region, Manaslu region, Tibet and is still going strong to explore more places in future. Krishna Sharma was born in beautiful laps of Kathmandu Valley. From his early childhood he has been in trekking field with his family. From his early 18s he has been managing trekking groups with full satisfaction on works handled by him. 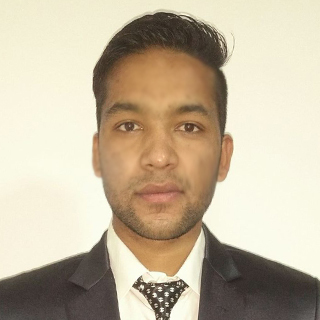 As a student he is now enduring his studies in Business Management and officially working with Himalayan Joy Adventure family as a new Office Manager. With his excellent command over English language and leading capacity along with large friend base in tourism field, he can assure you the fullest satisfaction in trips and treks handled by Himalayan Joy Adventure under his management. Bikram Karki is from solukhumbu district of Nepal which is well known for Mt. Everest location. He has been guiding in Nepali Himalayas since 2002. He is the well experienced guide. Starting his carrier as a trekking from supporting staff, Kitchen staff, Sherpa and assistance guide; he finally became a guide in 2005. He had done trekking guide course from NATHM (Nepal Academy of Tourism and Hotel Management) and achievement excellent grade from there too. He is a senior trekking guide in Himalayan Joy Adventure from our establishment date. He has proved to be and excellent guide among our clients via his hardship and helpfulness in the field. Also from Solukhumbu district, Pasang has established himself as a good climber of the Himalayas. He has been leading trekking group in Nepali mountains since 2003 and he had led the most of the peaks (as, Island Peak, Mera Peak, Labuche Paek, Thapa Peak, Thorang Peak, Pisang Peak, Chulu Peak etc.) in Nepal. 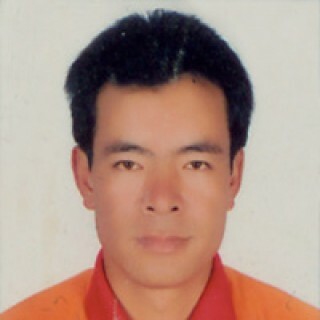 He is well experienced peak climber and trekking guide. He is senior climbing guide in Himalayan Joy Adventure since we started. All has satisfied all adventure loving clients of Himalayan Joy Adventure who love adventure of peak climbing. His helpfulness and friend base in local climbing routes has been advance option for trekking lovers when there is a need. He was born in lower khumbu the lap of Mout.Everest. He grew up and finished his school near his village. After his school, went to Kathmandu and he joint the collage.He started collage and trekking career in the same year. When he started the trekking as a porter which is the basic job in trekking field.He has done many treks in different trekking region with many tourist.Then, he upgrated in assistant guide and finally he has become a trained the government License holder guide since 2008. He has been working as a guide in Himalayan Joy Adventure since 2012 till now. 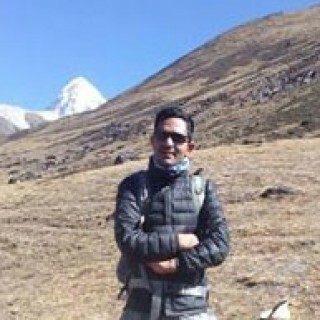 He has well knowledge about Nepal's trekking trails.The guests are always satisfied with his guiding. 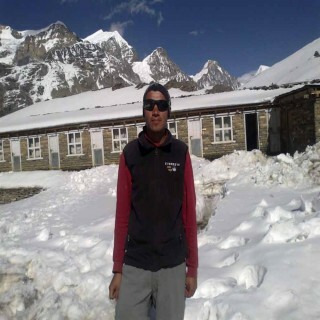 Kedar Karki is well experience trekking guide. He has been working in trekking since 2007 and he has been working in Himalayan Joy Adventure since Office establishment. According to his long experience, hardworking, honest personality and good care of tourist he has granted trekking guide licence after completed Trekking Guide Training Course from Nepal Academy of Tourism & Hotel Management. After he got Trekking Guide licence, he is working as trekking guide in Himalayan Joy Adventure since February 2014. 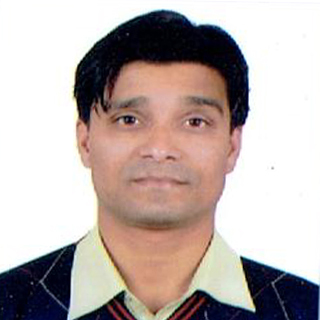 Nara Bahadur Karki is an energetic assistant Guide in Himalayan Joy Adventure. He had a wise to become tourist guide since his child age. He came in tourism field as a porter and followed to tourists in many different trekking trails. He is an honest, hardworking and friendly fellow. After a long run, he has collective knowledge about the trekking routes and finally,became an assistant guide in this company. Our guests are always fully satisfied with his excellent work. 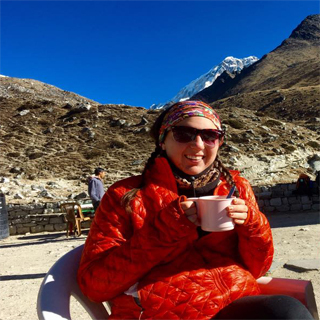 Danielle was born in the state of Michigan in the United States and joined the Himalayan Joy Adventure team in January of 2016. She is interested in the impact of tourism and development in Nepal and has written her thesis on this topic. Danielle loves trekking, cooking, and reading. She is passionate about sustainability and hopes to get summit an 8,000-meter peak at some point in her life. As Himalayan Joy Adventure’s marking executive, Danielle works to ensure that our company is transparent in our business practices and works to ensure that people have a wonderful time while trekking with Himalayan Joy. She is grateful for all the staff at Himalayan Joy who have welcomed her into the family and taught her about trekking in Nepal. Kumar Lamsal is a well-known personality in Nepal tourism. Despite being qualified in master of literature and an advocate, he has experience of working for more than a decade in tourism industry. He started as a porter in trekking industry from his early age and has trekked almost all the trekking trails of Nepal. With deep knowledge in history, culture, religion, geography and mountains of Nepal Mr. Kumar is still serving Nepalese tourism as a trekking and tour guide. Being involved in some NGO’s and Organization, he is also working as a legal adviser to them. His down to earth nature and deep knowledge in subject matter has made him one of the most demanded and reliable trekking and tour guide in the tourism industry. Himalayan Joy Adventure Pvt. 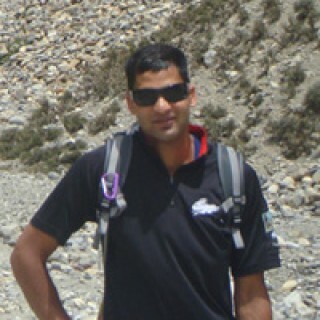 Ltd, feels proud to have him as a trekking and tour leader. Dhan (Dhak) Raj Karki is a well-known person in tourism field of Nepal. He has quite long experience and an in-depth understanding about trekking and tour of Nepal. 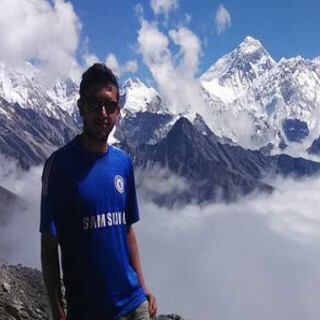 He has been working in Himalayan Joy Adventure as a Marketing Executive since 2011. Right now he is working in Poland, at the same time as being a part of the Himalayan Joy Adventure team in expanding the European market. 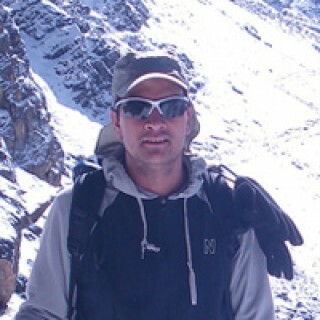 His breathtaking Himalayan trekking experiences help travelling in the Himalayas to our potential clients. Manoj Pokharel was born in Himalayas region. Early childhood, he had an interest to become successful fellow in Nepal's tourism and as his interest came in tourism. He has already spent 5 years in this field and has gained collective knowledge about trekking and tours. He is a marketing executive in Himalayan Joy Adventure since 2014. Now, he is in Poland in working purpose, at the same time as a representative of this company, marketing in European tourism field. Mr. Tenjin Sherpa is origionally from Solukhumbu Mount Mera Peak region. Tenjin is one of the seniour climbing leader in our company Himalayan Joy Adventure since 2014 but he has been leading group in many different mountain since 2006. He has led most of the mountain in Nepal as a expedition leader. Eventhough he has led many differents peaks as he lives in Mera Base Camp as a hotel owner, he leads our group to Mear Peak now. If you would like to have a adventure experience with Tenjin and Himalayan Joy Adventure please feel free to contact us.